The Trump White House on Wednesday will host its first iftar, a meal shared by Muslims during Ramadan, after failing to host the dinner last year. "Iftar is one of the religious observances of Ramadan and is often done as a community, with people gathering to break their fast together," the White House said in a statement. In 1996, Hillary Clinton held the first White House iftar dinner, a tradition continued through the Clinton, Bush, and Obama administrations. 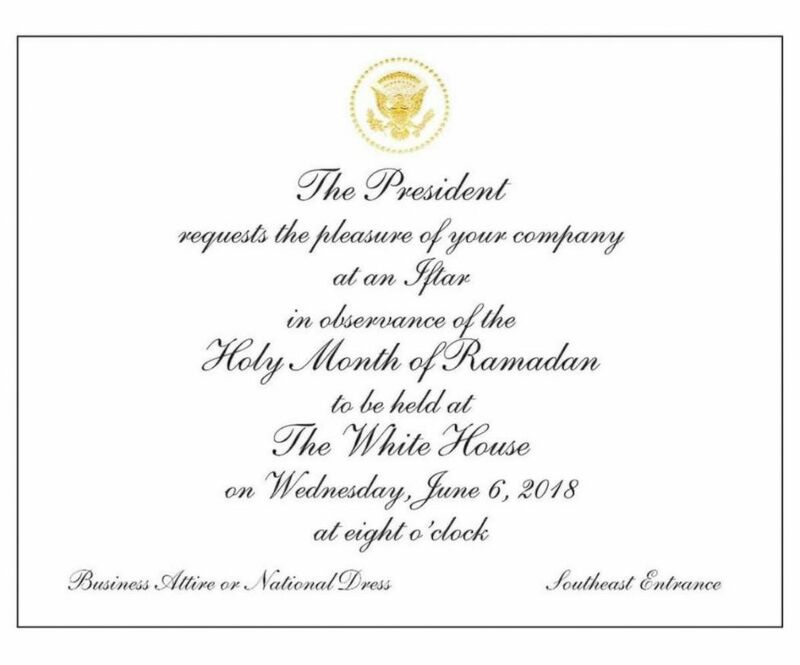 The invitation to an iftar at the White House on June 6, 2018. Last year, the White House did not host an iftar, sparking backlash from many in the Muslim community who took it as a slight. The White House and Muslim American community have had at times a tense relationship after President Donald Trump's inflammatory statements about Islam on the campaign trail and his ban on immigration from predominantly Muslim countries. Saba Ahmed, leader of the Republican Muslim Coalition, said she thinks Wednesday's iftar "is a good start." "I think it's a great initiative," Ahmed said. She was not invited to the event. "It's nice to see President Trump reinstate the Ramadan tradition at the White House." Still, she acknowledged the impact the president's past comments have had on the Muslim community. "There's a lot of backlash within the Muslim community to work with the White House after the Muslim ban, and comments made by President Trump have offended people in the community," Ahmed said. Wednesday night's iftar invitation with the president and vice president was extended mostly to the diplomatic corps. The White House did not respond to a request for a guest list, although typically, the administration does not release names of attendees until after the event. The White House announced the Imam who will lead the call to prayer at the iftar will be U.S. Army Lt. Col. Dawud Abdul-Aziz Agbere, a member of the Chaplain Corps. Ramadan for Muslims is a time of prayer and reflection, when Muslims fast during the day and then break the fast with iftar, typically a social gathering with family and friends. While the dinner is being held at the White House, the Council for American-Islamic Relations (CAIR) and other civil rights groups will hold a counterpoint iftar just across Pennsylvania Avenue in Lafayette Square, with dozens of people participating in prayer at sunset followed by food and drink. "We want to point out the hypocrisy of the White House's iftar after they skip it for a year, then launch a Muslim ban, implement extreme vetting, increase surveillance of Muslims in the U.S. and then act like we're all friends," said Robert McCaw, director of government affairs for CAIR. At the beginning of Ramadan, the president issued a message sending his "greetings and best wishes to all Muslims." "In this spirit of thanksgiving and reflection, those observing Ramadan can strengthen our communities, help those in need, and serve as good examples for how to live a holy life," Trump said in a message. "Ramadan reminds us of the richness Muslims add to the religious tapestry of American life."